At the invitation of Foreign Minister Wang Yi, US Secretary of State Rex Tillerson will pay a visit to China on September 30. During his visit, the two sides will exchange views on China-US relations, President Trump's state visit to China at the invitation of President Xi Jinping this year and major international and regional issues. Q: When it comes to the DPRK, US President Trump said yesterday that the military option is not preferred, but if the US does have to use the military option, it would be devastating. What is China's comment on this? A: We have taken similar questions many times recently. The Chinese side is committed to realizing the goal of the denuclearization of the Korean Peninsula and upholding the international non-proliferation regime. Meanwhile, we also dedicate ourselves to safeguarding the peace and stability of the Korean Peninsula and peacefully resolving the Korean Peninsula nuclear issue through dialogue and consultation. We always believe that military means should not be an option to resolve the Korean Peninsula nuclear issue because force will in no way settle disputes, but will only bring greater suffering, unbearable to all relevant parties. Yesterday, I also said on this occasion that it will even bring misfortune to regional countries. We hope that all relevant parties can avoid the words and actions that could escalate the tensions and make the situation even worse. 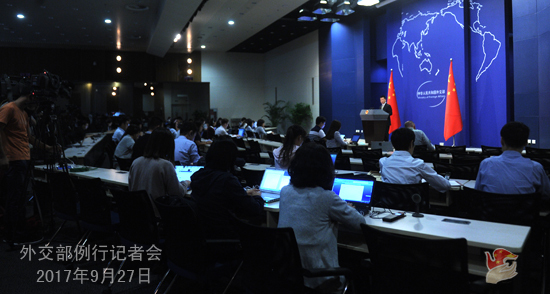 Q: Recent days have witnessed quite frequent official contacts between China and the United States. US Secretary of Commerce Wilbur Ross has just wrapped up his visit to China this week. Just now you also mentioned that US Secretary of State Rex Tillerson will pay a visit to China this week. In addition, we have also noted that the first round of China-US Social and People-to-People Dialogue will be held in Washington D.C. this week. What does such frequent exchange of visits mean? A: It is not surprising that China and the United States maintain such frequent contacts within this week. This actually demonstrates that China and the United States, as two major countries, have normal and sound bilateral relations. Since the successful meeting between the heads of the two states in Mar-a-Lago and their meeting in Hamburg, Germany, communication and exchanges at the top and other levels between the two countries have been frequent. 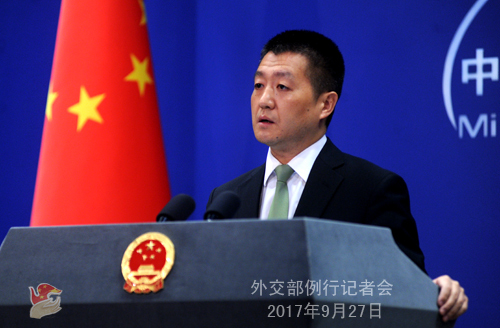 We believe that this is conducive to the steady growth of China-US relations. Currently, both the bilateral relations and bilateral cooperation have been growing in depth and breadth, which not only has delivered tangible benefits to the two countries and two peoples but also meets the shared aspirations of the international community. The Chinese side stands ready to maintain the sound momentum of bilateral exchanges and cooperation with the United States on the basis of what we have achieved, make joint efforts with the United States to ensure that President Trump's state visit to China at the invitation of President Xi Jinping this year will reap positive outcomes and inject greater impetus into the sound, steady and sustained development of China-US relations. Q: It is reported that Russia hopes that the United Nations could dispatch peacekeeping force to some regions of Ukraine. What is China's position on this? A: Presently, the UN Security Council is deliberating on the relevant draft resolution proposed by Russia. The Chinese side supports all the proposals that can contribute to the political settlement of the crisis in Ukraine. Q: Can you give us more details about US Secretary of State Rex Tillerson's visit to China? Which leaders from the Chinese side will meet with him? A: China and the United States are maintaining communication on the detailed arrangements of US Secretary of State Rex Tillerson's visit to China. As far as I know, State Councilor Yang Jiechi will meet with him and Foreign Minister Wang Yi will hold talks with him. We will release the further information about this visit in a timely manner. Q: According to media reports, while attending the commemorative activities for the 10th anniversary of the release of the October 4 Inter-Korean Joint Declaration, the ROK President Moon Jae-in said that many contents in the Declaration are still relevant today, including resuming the military talks at an early date and easing the tense situation on the Korean Peninsula. If the DPRK stops developing nuclear and missile programs, the door will always remain open for dialogue and the ROK will join hands with the international community to help with the development of the DPRK. On the same day, the spokesperson of the ROK Foreign Ministry said that the US and the ROK have explicitly stated that they stay committed to peacefully realizing the denuclearization of the Korean Peninsula. The US has confirmed many times that the diplomatic means is the No.1 option to resolve the Korean Peninsula nuclear issue. What is China's comment on this? A: We have taken note of the relevant report. The current situation on the Korean Peninsula is already highly complex and sensitive. Against this backdrop, we encourage all the positive signals to call for the commitment to peacefully resolving the Korean peninsula issue through dialogue and consultation. This accords with China's consistent position. We believe that this also meets the shared aspirations and common expectations of the international community. Actually, the September 19 Joint Statement has established the consensus on realizing the denuclearization of the Korean Peninsula, improving relations with each other, promoting economic cooperation and providing assistance for the development of the DPRK and jointly upholding the peace and stability of Northeast Asia. We hope that all relevant parties can work for the shared goal and jointly play a constructive role in advancing the denuclearization of the Korean Peninsula and peacefully resolving the Korean Peninsula nuclear issue. Q: Yesterday, the DPRK Foreign Minister Ri Yong Ho arrived in Beijing. Did the Chinese side make some special arrangements to meet with him? A: I believe that Foreign Minister Ri Yong Ho made a stopover in Beijing. I have not heard of the information mentioned by you just now. Q: China is financing a lot of economic projects in the Rahkine State, including the investment in the pipeline and the special economic zone. The Rahkine State now is affected by ethnic violence. Is China concerned about its investment there? 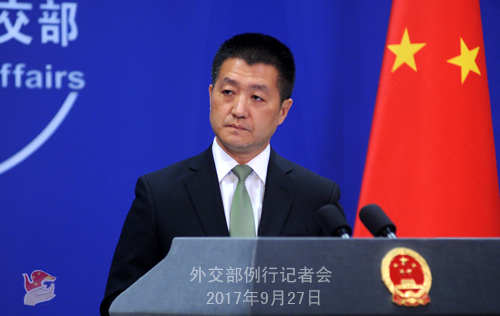 A: Regarding the current situation in the Rahkine State of Myanmar, China's position is quite clear-cut and we have stated it many times. You mentioned China's investment in Myanmar and some projects including the infrastructure which are being constructed under the joint efforts of China and Myanmar. We have said many times that these projects are based on the friendly consultations between China and Myanmar and they are conducive to local development and the livelihood of the local people and serve the common interests of the two sides. We are convinced that China and Myanmar will make concerted efforts to advance these projects so as to deliver more benefits to the two peoples. Q: Yesterday, the High Council of Iraq's Kurdistan Region for independence referendum announced that according to preliminary statistics, the turnout of the referendum is 78% and over 80% of the voters support the independence of the Kurdistan Region. The final result will be released soon. What is your comment on this? A: The Chinese side has noted the responses of regional countries and the international community to the independence referendum held in Iraq's Kurdistan Region. I would like to reiterate that China always advocates safeguarding the sovereignty, unity and territorial integrity of Iraq and calls upon all relevant parties to properly resolve their differences through dialogue and consultation and jointly uphold the peace and stability of Iraq and the region at large.